This is the stable version, checked on 8 April 2016. (I cannot work, I cannot work, I am unable to work. Chan urrainn dhomg obair a dheanamh. Chan urrainn dhomh obair a dheanamh. Source for notated version: Donald Angus Beaton (Mabou, Cape Breton) [Dunlay & Greenberg, Dunlay & Reich]. 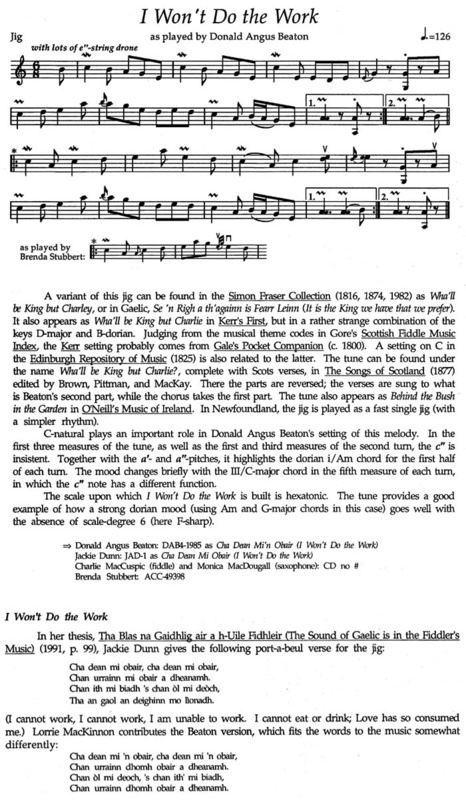 Printed sources: Dunlay & Greenberg (Traditional Celtic Violin Music of Cape Breton), 1996; p. 110. Dunlay & Reich (Traditional Celtic Fiddle Music of Cape Breton), 1986; p. 71. Recorded sources: ACC-49398, Brenda Stubbert - “House Sessions” (1992). DAB4 1985, Donald Angus Beaton "A Musical Legacy" (1985). JAD-1, Jackie Dunn - “Dunn to a T” (1995). Rounder Records 7057, Jerry Holland – “Parlor Music” (2005). This page was last modified on 8 April 2016, at 00:28.